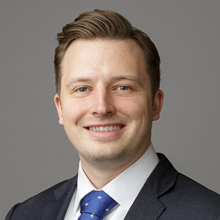 As an associate at the Firm, Ante S. Kovacevic specializes in prosecuting patents for clients in the areas of industrial and mechanical technologies and preparing patents for clients in the area of medical devices. His education and background in mechanical engineering affords him a unique understanding of clients’ technologies. In addition to prosecuting and preparing patents, he serves on the Firm’s Sustainability Committee. Prior to joining the Firm, Mr. Kovacevic worked as a patent engineer where he drafted provisional patent applications, non-provisional patent applications, and office actions. He has experience conducting legal research, drafting claims, and performing patentability searches. In law school, at Chicago-Kent College of Law, Illinois Institute of Technology, Mr. Kovacevic was a member and editor of the Chicago-Kent Journal of Intellectual Property and was the president of the Chicago-Kent Intellectual Property Law Society. Mr. Kovacevic received his B.S. in mechanical engineering from the University of Illinois at Chicago.